I decided that for my presentation that I wanted a moving Robot, so I took apart LucyLeia and built up another "bumper bug". Once again a different model. Here is the base of JohnMoses. Note: The Lego bricks with the wires were later connected to the RCX and his antennas were made longer. So in looking around the leJOS forum I have found a couple of interesting posts/discussions that have hopefully helped to put me on the right track although I am still getting errors. One of the discussions was talking about the classpath variable that someone else had had some problems with and had put what they had done that helped to fix the problem. I changed the format to the way suggested and that is how the environment variable is now. Another one that was talking about Environment variables also gave some advice which I have put to use. I also redownloaded the version 3 of leJOS, in case there was some problem with the original download. Some one on the forum had suggested this to someone else who was having a similar problem. I tried uninstalling the newer version of Java 1.6 and installing an older version, but I am still get the error. I think that I might have finally come to a Roadblock, in the sense of Time. At this point in time, I will take it as a learning experience for what I have received and move on to wrapping up my independent study. I wouldn't be surprise if the last post in this discussion describes the problem that I have been experiencing. So I'm back and working on the Java environment. I have been able to get the firmware to download to the RCX unit once again. I ended up googling "leJOS 3 serial port", which ended up leading me to a page that gave me information that the error I was getting was related to bad code in the 3 release. I followed the directions/suggestions that was suggested for getting the firmware to download. The summary of the fix was to copy files for the COM port from version 2 and replace the version 3 files. So right now I am sitting with an RCX brick that is ready to receive the Compiled Java code, which I would love to get to download. But I have received a large error message about not being able to find certain file(s), so hopefully I will be able to find a solution pretty quickly on the leJOS forum. On another note: To account for the time of when Uni was closed on Friday...what did I do you ask. Well honestly I didn't do anything but I made up for it on Saturday by working 3 hours on my paper. The good news is that it is pretty close to done, of course if I get the Java up and running I will have some revisions to make. Added an update about him going in circles underneath the first video. Yesterday after the last post, I began work on a new model of Robot. The purpose behind this robot is pretty similar to the Bumper Bug, he bumps into something, he changes direction. The reason though that I wanted to build this Robot from Baum's book is because to turn the wheels it only takes one motor, unlike the previous ones which would take two. The problem with the robot taking two motors to move is that it takes up all of my motors so then I can't have another one to be able to do other neat features with. This Robot once again goes with a "three" wheel approach. The structure on the left is what the back wheels are attached to. By looking inside you can see the gear structure that turns the back wheels. This is the ratchet, which locks the left wheel up, when going backwards or turning. This allows the robot to be able to turn with only one motor. In the earlier models of the robots, one of the motors would be turned off, when the robot needed to turn. Here he ran himself up the table foot and ended up sitting on his rear. So exciting news...okay maybe not so exciting...same robot doing same things...but once again with different code. So believe it or not, he was running just fine before I got my camera out...apparently he is camera shy. What I noticed though, when he couldn't find the line was that he just kept going back and forth, then into doing circles. So if I can come up with some brilliant way to get him to realize that he is in the middle of the circle, when he is...then I might add it to the code. But as I have limited time this J-term and more to do, I will probably go on and continue learning, coming back to it if time/or a brilliant idea jumps into my head. This morning I began to download some different environments to program in for the RCX unit. I decided to start with using Not Quite C (NQC), which is described in good detail in Baum's book. I tried to jump into programming RCX for the current robot that is built, but in looking at the code in the book, I decided that I might need to go do the reading at the beginning of the book, so that I will have a better idea of how to modify it for the line follower design by Knudsen. The biggest difference from what I can tell, is that Knudsen used wheels and Baum used the treads. In many ways I am excited to be getting into NQC because it is putting me back into a good old command line programming interface, versus the Graphical User Interface, which I am having problems completing understanding what I am telling the Robot to do. 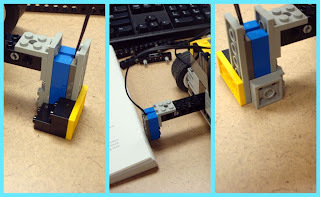 So before we get to the video, I thought that I would share a picture of what I did to help flatten out a crease in the black line track (which had caused me problems)...The books that are shown there are the books that I have been using to learn about the Lego Robot. That was done while I was on a short break from the studies. It did seem to make a difference. Here is the video of the working code that was suggest by Baum. Baum's idea of getting the Robot to follow the line was not to directly follow the black line but the edge of the line. This way the if the sensor got values for the black line, the robot could turn accordingly. Or if the sensor sent values for the white part of the track, it would then turn the other way. Both of the programs, give me the same result but I did notice that with Baum's algorithm that Caleb Tricycle didn't swing as far out as with Knudsen's algorithm. Another note...one of the things that I found interesting was that the Robot was still able to run its program, when it began to run off of the mat because the carpet was dark enough...This is at the end of the video. I worked about 30 minutes organizing the Legos, so that I had a good idea of where to find different pieces. I believe that the reason for this problem has to do with the numbers that are used by the robot coming from the light sensor are not set right. Basically, I need to go back and work with Caleb Tricycle to try and achieve numbers that allow him to turn according to what the light sensor says. Why is this being posted after the successful post about Caleb Tricycle? Because I read in the Baum book about a different algorithm to use for a line follower and decided to try it with my modified Knudsen design. So right now...He just likes to run straight a head. A quick note about the downloading problem....I am wondering if I am having the problem because the computer is some how getting confused, when I am switching back and forth from remote desktop to directly on the desktop. Just a guess....the last two times I downloaded a program, I was able to download it without restarting the Computer. Back to program to try and figure out the numbers. I lowered the Light sensor by using a flat Lego piece, I then surround the light sensor with other Legos making sure that they didn't have holes that would allow light in. If they did, I used another flat Lego to cover up the hole. The picture on the far left shows what I ended up using to block out the light, I had run out of the wrap around Lego pieces that I used in the right picture, because I had used one to let the light sensor point down. The picture in the middle is what it looked like before. I followed the program that was set out in Knudsen's book. The numbers in this picture are not the numbers I ended up using with the program, I started out with the numbers that are given in the book. Then adjusted them as I saw when using a guided mode in the Programming environment. I once again ran into a problem of getting the program to download to the RCX, this time I decided to restart the computer and make sure that the RCX was on near the beginning of bringing up the program on the machine. It then transferred just fine and allowed me to use a mode to test the code to find out numbers that I needed to be able to tell when the sensor was picking up dark verse light. I was also able download the program a couple of times in order make adjustments to the numbers. After watching the program run on the Robot, I had the thought that his back wheel reminded me of a dog's tail. I decided then that I should adjust his name to Caleb Tricycle...since Caleb means dog. So here is Caleb Tricycle running...including running off of the mat with the black trail that it is following. The mat came with the Lego Set. So after Success with the Bumper bug...I read some more in the books and saw what they had to say. I like the Knudsen book best, I think, because it does a good job of getting you active and then explaining higher concepts, behind design and mechanics of building good robots. So in reading some more from it in after building bumper bug, I found that it was repeating some of what I had already read in the introduction of the Baum book. I also looked at the Baum book on what they had to say on building a bumper robot (one that knows to back up and try a different direction). The concepts were pretty close to the same although they had taken a slightly different route making the bumper and also had example code in another programming environment, which I am planning on coming back to for my final project. He has gotten his free movin' leg attached, but no motors. The white wheel object is part of what was left at the time of bumper bug, it is connected to part of the base that I had taken the RCX unit off of and hadn't need to fully get into other of its parts. What Tricycle looked like most of the time while being built, flat on his back. Or on the face of the RCX unit. I believe that he is in the same state as the above picture, only in a different angle. On a side note: I would like to bring your attention to the grey tool on the bottom right corner of picture, it is a tool that helps you take a part the lego bricks...Saving my fingers from great pain in the taking a part of creations. He has now been given his "nose", where the light sensor will go and the motors that will provide the energy/turning motion for his wheels. The light sensor part is how Tricycle will be able to tell if he is on a black line or not. Here is the finished product of building the Robot. The big wheels are in front of the motors (there is one directly across for the one in the picture). The light sensor is the blue brick. The black bricks on the RCX unit that have wires coming out of them is how the RCX communicates with the Light Sensor and the Motors. I have started the programming processes for Tricycle in the computer and believe that I am almost done. 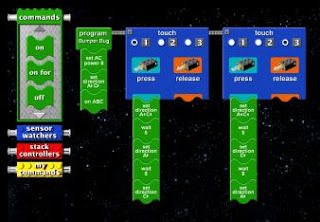 With this program, Knudsen is directing me through using subroute in the programming in the Lego Environment. He also brought up a point in the programming section on this robot that I would like to mention and that was: you need to prepare for the worst. I think that I already knew this, because part of robotics is the need for the robot to be able to communicate with the world and the world is not a science labitory. So in programming this robot to follow a black line, we can't just assume that if he doesn't sense the line that he needs to turn the opsite way that he did before to find it because the line could be curved. 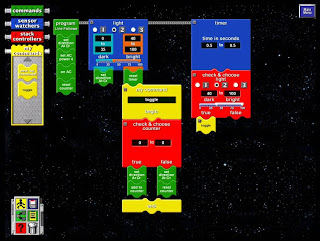 Therefore in this program, we will use a timer in order for the robot to know when he needs to turn the other way to try and find the line again. So for those of you who hear my voice very softly....I am simply talking to myself in the excitement of seeing the Robot move around or wondering at what it is doing. The first object that he bumps into is my lunch bag, then he starts to go over to a wall but doesn't bump into it...turns and starts going underneath the table, which I was impressed that it got the right angle to be able to go between the feet. I then stopped the recording because it was headed to feet that it was going to run into and it was going backwards. What you don't get to see before I turned the robot off, was that after trying to push himself backwards, he then changed his direction and tried to go a different way. I have now worked another 40 minutes for today, bring today's total to 1 hour and 40 minutes. The yellow brick is the RCX unit shown in another the post. The black unit standing up, is the IR transimitter, which is hooked up to the computer. The connection that it uses is a 9-pin serial connection (My guess what be that new models of the Lego Robots are now coming with USB connection....to answer a question of how it connects to the computer....according to the help that is linked in the next paragraph). Two large pieces....because the battery section is on the bottom of the RCX, which makes sense for the buttons need to go on top....but it is a pain to change batteries then once the robot is built. The green light that is showing is blinks and lights up when the IR transmitter is transmitting data. The numbers keep adding one while the firmware is transferring. And that is all the farther I have gotten so far, as I had to run and go do something for a couple of hours....I am now back and am going to try to convince the software on the computer, the IR transmitter and the RCX unit to all work together and transfer the program! What I call the "Bumper Bug"
The continued building of the Lego Robot of Yesterday. After the adding of the RCX unit and the trends for the Robot to be able to move. Side view of up above. The motors have been added, which allow the Robot to move. This is the final product of several hours of searching for pieces and building the Robot. The touch sensors are behind the yellow bars that are wrapping around the Robot. This allows the touch sensor to have a wider ability of sensing, since on the Lego block (underneath the black blocks with wires) have less than an inch for what gets pushed back into the block. With following the Knudsen as a guide for how to build a robot, I have been impressed with the design of the Robot, since it is not how I would have gone about it. In the book, he brought me through building the robot and then programming it in the environment. Most likely I would have programmed the robot on how I wanted it to move and then built it to go with the program. It was also interesting to see how he had me reinforce the build of the robot to make it more sturdy. Programming in the Lego Environment. I found that beginning to do the programming was a little bit difficult as I had to figure out how to put the commands together. The ability to drag and click allowed me to write the program quickly by following the example in the Knudsen's book. 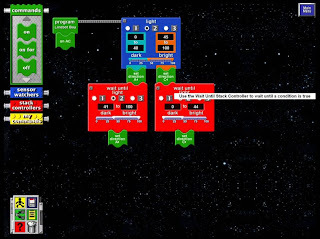 While the Robot is built and the program has been written and saved, I have run into an error that I will have to go figure out what is going on. The problem: The IR transmitter can't be found. Which means that I can't get the program right now from the computer to the RCX. I will be researching it so I can continue and see the Robot Work. In trying to diagnose the problem, I have googled the error message and found some help, but the suggestions tried haven't made a difference yet. Some quick background in Robots, according to Knudsen. When you get into mobile robots, you have tethered robots and autonomous robots. The main difference between the two is whether or not the robot carries everything with it (autonomous) or if it is tethered to a power source and/or a computer. Today I spent a good amount of time reading the beginning/introduction chapters of the two books plus getting firmware onto the RCX Unit. I am using an older Lego MindStorms Robotic Invention System (RIS). The brain of the Robot will be the RCX 1.0. It has two motors so that it can move around in the world. The two types of sensors that it has are touch sensors and light sensors.